Interventional neuroradiology (INR) has remarkably evolved over recent years and serves as an alternative to many open neurovascular procedures. Endovascular therapy is less invasive and allows for some interventions that simply cannot be performed with open surgery, making it a primary approach for treating a host of thrombo-occlusive and hemorrhagic neurovascular conditions. To that end, INR also poses many challenges for the anesthesiologist from caring for fragile or critically ill patients in an off-site location to having to navigate through various physical obstacles within the interventional suite. 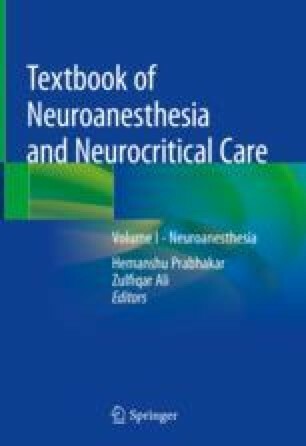 This chapter will (1) explore the challenges met with working in an angiography suite, (2) discuss a basic approach to the anesthetic regimen and management of common INR procedures, (3) review the uses of endovascular therapy in the treatment of various neurological conditions (both elective and emergent), and (4) discuss some of the common complications encountered in INR.